DID YOU MISS IN 2018......? 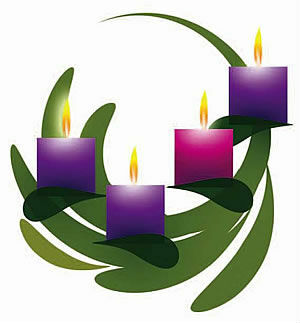 Fr Philip Barnes, Vicar of St Stephen's Gloucester Road, gave a talk on Advent at St John's on 27th November. Everyone was welcome to meet Fr Philip over drinks following the 6.00pm Mass. A sing-a-long of old-time favourites was held on 10th November marking the 100th anniversary of the end of World War One. The afternoon Concert was followed by refreshments in church. A Concert of Remembrance performed by the Vaska String quartet, with piano, sponsored by Bales College and Paddington Charities was held on 9th November. The evening Concert featured music by Mozart and Elgar as well as music specifically written for the left hand only. 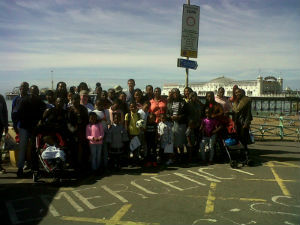 This year's Parish Outing was a day trip to Brighton on Saturday 11th August and it was a glorious day! Many of our party spent most of the time by the sea while others visited the famous Pavilion as well as the Lanes for a spot of shopping. While millions worldwide watched the marriage of Meghan Markle and Prince Harry on 19th May 2018, here at St John's we held our own celebrations to mark the special day. Festivities included a bouncy castle for the children, a buffet lunch in the vicarage garden and an evening BBQ and drinks. On the 12th May 2018 Maurice, our organist, was presented with the Order of St George at Great St Mary Church in Cambridge. The ceremony was followed by lunch at Queen's College. The Order of St George is an international association that exists to promote and pursue the traditions of chivalry by supporting works of charity. This year's Easter Vestry and APCM was held on 17th April 2018. Nigel Clark and Michael Tavenier continue as our Churchwardens while Maris Mathias has stood down. We welcome Rupert Gather who joined the PCC last October. Yema Barlay and Maria Heijenga continue as the Diocesan Synod Representatives. A full list of PCC members and appointments can be found here. DID YOU MISS IN 2017......? Our thanks to everyone who attended the Carol Service on 22nd December and helped to raise funds for The Children's Society and Embrace the Middle East. 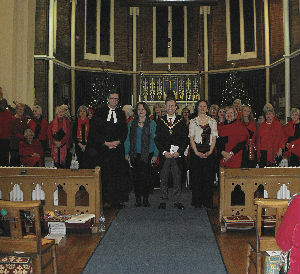 It was the perfect way to start the festive season with carol singing and readings. The All Sing! Harrow Road Community Choir returned to St John's with a concert in aid of the charity REAL ACTION ; supporting their work with the survivors of the Grenfell Tower fire. The event was attended by the Right Worshipful Lord Mayor of Westminster, Councillor Ian Adams. 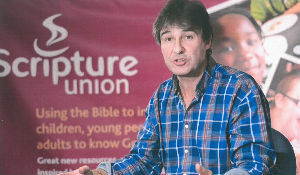 Tim Hastie-Smith, the Director of Scripture Union, gave a talk on Servant Leadership on Wednesday 29th November. Many thanks to those who turned out in the cold weather to support this event. We were pleased to welcome the Rt Revd Dr Stephen Platten, Chaplain to St Martin-within-Ludgate and formerly Bishop of Wakefield, on Advent Sunday (3rd December) to celebrate and preach. Following the All Souls' Day mass on 2nd November, a small group visit to the graves of Henry Edward Kendall Jnr and William Harrison Ainsworth in Kensal Green Cemetery. 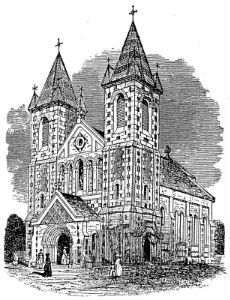 (Kendall was the architect who designed St John's Church while Ainsworth was one of our first Churchwardens. It was pleasing to see that Edward Kendall's grave had recently been restored. 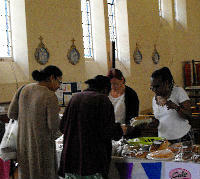 Harvest Festival at St John's was celebrated at Sunday mass on 24th September. 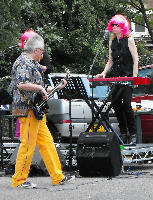 The festival was preceded by a well-attended Harvest Cheese and Wine Reception on Friday 22nd September! On 9th July a large group from St John's visited Harmondsworth, one of the villages potentially under threat from the building of a third runway at Heathrow Airport. Father David gave the sermon at the beautiful church of St Mary the Virgin (parts of which date back to the 12th century) before everyone was invited to tour the famous 15th century Great Barn. Barnardo's Big Toddle event at St John's on Sunday 25th June 2017 was a tremendous success. Nearly £300 was raised on the day for Barnardo's while one of our younger parishoners raised another £140 through her 'justgiving' page. Congratulations and thanks to those who helped with organising the event - and to all the 'little ones' who took part! 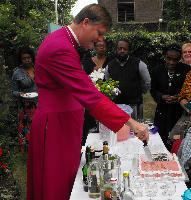 The visiting preacher Fr Neil Evans (Director of Ministry) kindly blessed the new kitchen. On 30th May a group from St John's visited Fulham Palace. 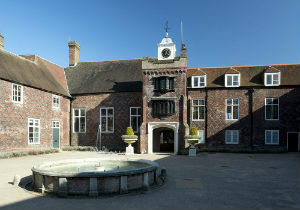 The Palace has a fascinating history as well as beautiful grounds and gardens. This is definitely one of London's hidden treasures! 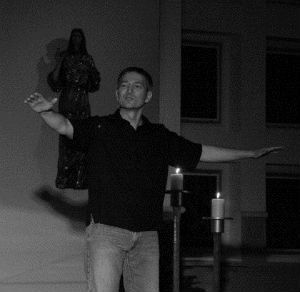 'Mark's Gospel Live' was performed by priest and actor Rev Joseph Morris on 17th May at St John's. It was an inspirational and powerful performance of St Mark's gospel which had the audience 'spellbound'. Rev Joseph has delivered his performance of 'Mark's Gospel Live' to high acclaim in the UK, Canada and the US. 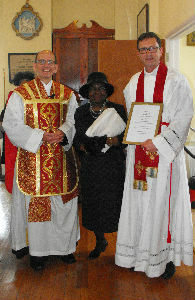 This year's Easter Vestry and APCM was held on 12th April. Nigel Clark and Michael Tavenier continue as Churchwardens while Joanne Okello decided not to stand for re-nomination to the PCC. Jo was thanked for her time on the PCC and we are delighted that she has agreed to continue her appointment as Children's Champion. We welcome Natelle Peters as a new member. After two terms (six years) Nigel Snuggs has stood down as Diocesan Synod Representative and has now been elected to the PCC. Yema Barlay has agreed to become the new Representative, working alongside Maria Heijenga. The Harrow Road All Sing! 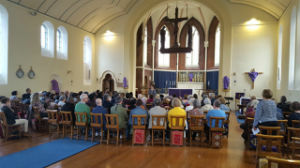 Community Choir returned to St John's on 1st April. In addition to performing, the Choir held a workshop for the membership - and for those interested in joining. The afternoon was extremely well attended and it was great fun! DID YOU MISS IN 2016......? 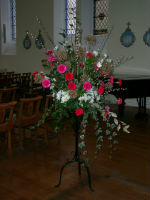 Our thanks, as ever, to everyone who helped with our Christmas preparations and activities. In addition to the Christmas Services, we were delighted to welcome back the Silk Street Sinfonia for a wonderful Festive Concert! Once again our Christmas collections contributed to our support for The Children's Society. Together with donations, over £500 was raised this year! 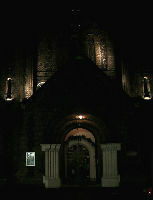 Our popular sing-a-long concert of old-time favourites was held at St John's Church in aid of the Royal British Legion. Thank you to everyone who joined us and helped to raise funds. The All Souls Day Mass at 10.00am was followed by a visit to the graves of Henry Edward Kendall Jnr and William Harrison Ainsworth who are both buried in near by Kensal Green Cemetery. 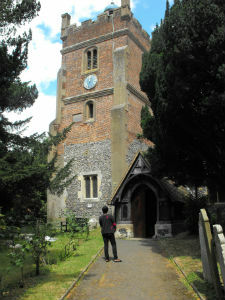 Kendall was the architect of St John's while Ainsworth, the celebrated author, was one of St John's first Churchwardens. Read more about St John's history here. Harvest Supper & Barn Dance: Saturday 24th September This year the Barn Dance evening replaced the Harvest Festival lunch - and proved to be a huge success. It was an evening of family fun with lots of food and dancing - yee ha! Our thanks to everyone who helped to make this an enjoyable evening! The day-trip to Walsingham (and the sea-side! )was well attended. It is hoped that those who attended this popular outing might consider joining the Walsingham Pilgrimage weekend in future years. This year's parish outing was a day-trip to Highgrove, in celebration of HM The Queen's 90th birthday. Highgrove's gardens have been created by HRH The Prince of Wales during the past 30 years. It was a wonderfully relaxing day, touring the grounds and learning how everything is produced organically. 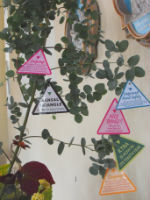 Many took the opportunity to pick up a few tips for their own gardens! Everyone had a fantastic time at Thorpe Park! It was a particularly hot day so many cooled off on the water rides before enjoying ice cream on 'the beach'. St John's celebrated The Queen's 90th birthday during the weekend of 10th-12th June. With the generous support of local community groups, businesses and schools the Festival was a tremendous success. Our thanks to everyone who helped with preparations, displays, refreshments, raffle contributions - and clearing up! Here are just a few images from the Festival. More pictures from the Festival can be seen here! Our popular Summer Sing-along was extremely well attended this year. 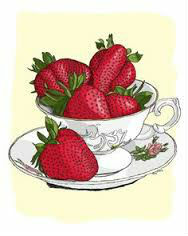 All washed-down with a delicious strawberry tea! Our thanks to everyone who helped to make this an enjoyable afternoon. 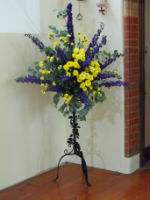 This year's Easter Vestry and APCM was held on 13th March. It was a poignant occasion as two of St John's volunteers announced their decisions to stand-down from their respective church roles. Anne Abel has stood-down as Churchwarden after 20 years of service. We gave thanks for Anne's work as Churchwarden on Palm Sunday, when the Bishop of Fulham presented Anne with a gift from the congregation; a commissioned painting of St John's. Anne will now be dedicating her time to the demanding role of Pastoral Assistant. Gwen Buncombe has been one of our longest serving PCC members and has undertaken a number of responsibilities, including Treasurer and Social Secretary. Following her decision to stand-down from the PCC, Gwen was presented with a gift of thanks on Easter Day. 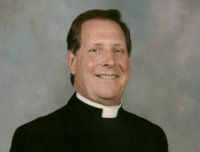 We welcome Nigel Clark as Churchwarden, working alongside Michael Tavenier. 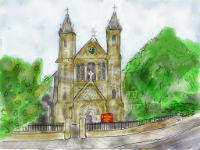 Directions on how to order prints of the commissioned painting of St John's can be found here. On Sunday 31st January we welcomed The Venerable Luke Miller, the new Archdeacon of London, at St John's. 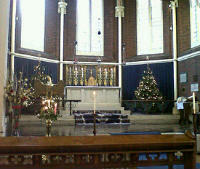 During the 11.00 mass, the Archdeacon rededicated our restored statues of Our Lady of Walsingham and St Joseph. The Archdeacon is based at The Old Deanery and is working alongside our new Associate Archdeacon, Rosemary Lain-Priestly. DID YOU MISS IN 2015......? 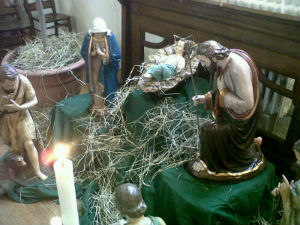 Our thanks to everyone who helped with church preparations during the weeks prior to Christmas. This year the task of cleaning and decorating was a particular challenge as the final phase of restoration work continued. Happily the plaster work and painting within the church is now complete! Concerts and carol services were well attended, with Christmas collections and donations contributing to our support for The Children's Society. With thanks again to all our helpers and best wishes for the New Year! Our Church Warden Anne Abel has become an Officer of the Most Venerable Order of St John of Jerusalem. Anne received the award on 20th October 2015, in recognition of her 30 years of voluntary work with St John's Ambulance. Describing the award as "wonderful news" Anne only signed up for a six week course with St John's Ambulance in 1985! Following last year's successful event, St John's held a concert in advance of Remembrance weekend, featuring well-known war-era songs. 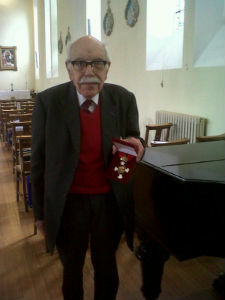 The Concert was free to attend with a collection for the Royal British Legion. Thank you to all those who attended and for giving generously! Those who attended this year's pilgrimage enjoyed a relaxing and thoughtful weekend in the beautiful surroundings of Walsingham. On Saturday 5th September St John's hosted a recital for Iraqi Christians in Need (ICIN). The evening featured Carl Bahoshy preforming a varied programme; including works by Chopin, Debussy and Rachmaninoff. Admission was free, with donations going towards the work of ICIN. 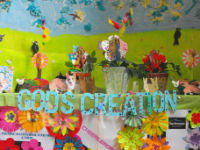 This year the Junior Church (Sunday School) visited London Zoo. Seven children and their parents & carers joined the trip, with some making their way to the Zoo by canal boat from Little Venice. 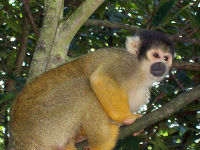 The weather was excellent and everyone enjoyed looking at all the different animals - including this cheeky chap! A 10th Anniversary Requiem Mass was held on Saturday 1st August for Father Royston Beal (vicar at St John's from 1970 to 2005). The Venerable Doctor William Jacobs, former Archdeacon of Charing Cross, gave the address and the service was attended by members of Fr Beal's family, and his many friends. 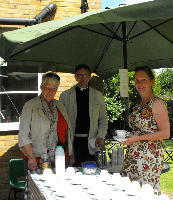 St John's was delighted to host this year's Neighbours' Summer Party. 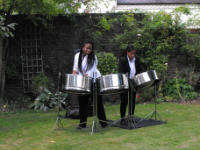 The party took place in the vicarage garden and was well attended by local Kensal residents. There were many delicious contributions of buffet food and refreshments! We enjoyed perfect weather at this year's B-B-Q in the vicarage garden and it was a lovely way to celebrate Fr David's birthday. Many thanks, as ever, to those who helped with setting up - and clearing up! 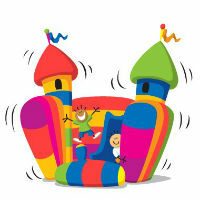 St John's Summer Fete took place on Saturday 20th June; with a variety of stalls, refreshments and - a bouncy castle! 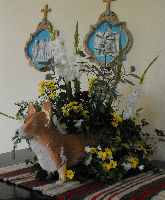 Nearly £630 was raised for the church re-decoration fund. Our thanks to everyone who ran the stalls and helped with arrangements on the day. On the 200th anniversary of the Battle of Waterloo, Father David conducted an Act of Remembrance for the 1st Regiment Royal Horse Artillery at the Anglican Chapel in Kensal Green Cemetery. Wreaths of laurel leaves, charged with cornflowers and red roses, were then placed on the graves of soldiers who had fought in the battle. Members of St John's congregation joined 1 RHA in this moving ceremony. St John's church is hosting a series of Recitals and Concerts through the Summer - and beyond! Find out more on our Concerts page or take a look at the St John's Music website for dates and times. The first Lunchtime Recital took place on Thursday 7th May and featured guitarist Laura Snowden. The programme included a variety of both traditional and more modern classical music - a very pleasant way to spend lunchtime! 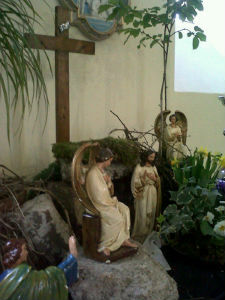 The Easter Vestry and APCM were held on Sunday 26th April. 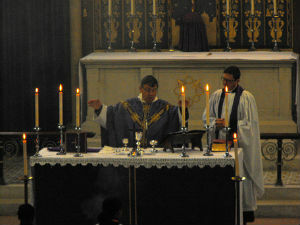 During Lent St John's held a number of special events, starting with a Quiet Afternoon on 14th February. 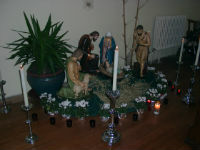 The Lent Course, arranged by St Thomas' ran from 25th February. In addition there were two 'Film Showings': The Sound of Music (for children) on 21st March and The Way (for adults) on 28th March. Services were held throughout Holy Week and included the Liturgy of the Lord's passion on Good Friday and Easter Vigil on Holy Saturday. The weather was especially kind on Easter Sunday - perfect for The Big Easter Egg Hunt! AND DID YOU MISS in 2014......? St John's hosted a full a varied programme of Christmas events and services in December, including: choir concerts, a Christmas lunch and Christingle. We were particularly pleased to welcome the Bishop of Fulham who led our Midnight Mass. The Bishop of Fulham led a special service of thanksgiving on Sunday 6th July, to celebrate St John's 170th anniversary and to give thanks for the completion of recent external restoration work. 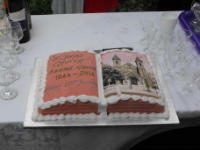 The service was followed by a drinks reception in the vicarage garden and the cutting of the 'Anniversary Cake' baked by Eliza Christmas. Despite the terrible weather, our commemorative concert was well attended. The concert featured songs from the era of The Great War and was followed by a short act of remembrance. The retiring collection was for the Royal British Legion. 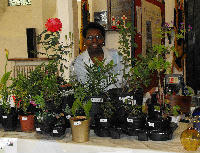 Our Harvest Festival was held on Sunday 28th September. The service was followed by a traditional Harvest Lunch - an impressive 'bring and share' feast ! Thank you to everyone who brought food and drink - and for helping with preparations on the day. 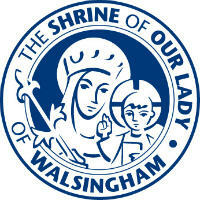 The Walsingham Pilgrimage took place over the weekend of 10th-12th October. Despite the slightly chilly weather, it was an enjoyable and restorative few days. 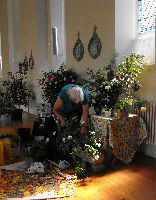 As ever, we are grateful to Anne for making all the arrangements and ensuring that everyone had a relaxing weekend. 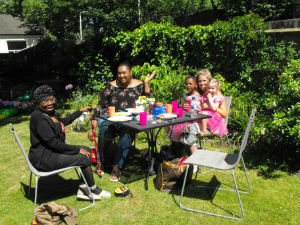 On 16th August we gathered in the vicarage garden for St John's BBQ. This has become a regular Summer feature - and this year there was music too! Didn't we have a lovely time the day we went to...the Cotswolds! This year's Summer Outing to the Cotswolds included a picnic lunch and a walk along the River Windrush. The weather was kind - a perfect Summer's day in the country. 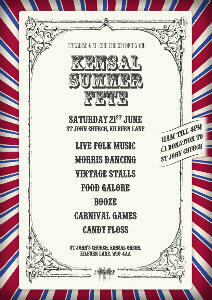 St John's joined forces with The Paradise for the Kensal Summer Fete - we could not have hoped (prayed?) for more glorious weather! There were a variety of activities, food, stalls galore, more food, a grand raffle, live entertainment and....even more food. 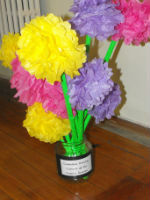 Furthermore, the church stalls and raffle raised over £1,000 for St John's. Our thanks to everyone who helped make this a successful day. There were lots of pots - and plants!